The following books are availble for purchase. Recipes for learning engagement success. In this publication, from trainer training expert Marc Ratcliffe, it outlines how to create a recipe for learning and teaching success and offers genuine food for thought when structuring the training experience. Want to broaden your learners’ experiences while adding fun to your delivery? 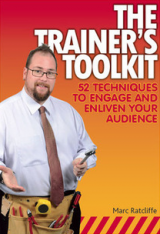 This easy read will help you create your own trainer’s toolkit in no time! Don't leave money sitting on the table! 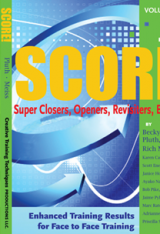 This latest edition of the SCORE! series brings you more than 50 new, never before published exercises for opening your training with impact, closing with action planning, revisiting content in ways that increase retention to at least 80 percent, and energizing your learners to ensure they stay fresh and attentive. Maximize impact in your sessions without starting from scratch! You can immediately use these activities. You’ll want this book in your library for quick reference. Participants in a typical training only retain about 20% of the information within 21 days of training. Activities in this book are designed to have learners strategically interact with your material to increase their retention to 80% or more. 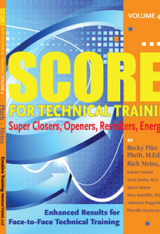 This book holds 70 closers, openers, review methods and energizers created or adapted by Rich Meiss and Bob Pike, both known in the training industry for their commitment to participant-centered, instructor-led education. Maximize impact in your sessions without starting from scratch! You can immediately use these activities. Photocopy permission is granted for easy use in your training. There is no boring content, only boring presenters! The perception of boring content, especially in technical training, is a result of presenters not sharing with their learners what's in it for them and then choosing a dull and dry format with which to present the information. Once you have shown your learners how their lives, jobs, work performance, environment or safety can be better through the implementation of your training, use these activities to help learners assimilate the information in a fun and engaging way so they can remember the information and use it on the job! Energize your learners so they are excited and ready to learn more! The activities are specifically designed for those who do technical training, especially in face-to-face settings. These activities have been tested and proven successful in training classes for over 20 years by Bob Pike Group trainers. So, what are you waiting for? Get this title now and revolutionize your technical training! RESULT: You’re doing lots but getting nowhere: Why? Because compliance and change are driving you and your RTO instead of YOU being in the driver’s seat. Remember the fairytale of The Three Little Pigs who built their houses on straw, stick and brick? Well that’s actually how we build our RTOs. This book provides practical simple solutions to help you build a simple, profitable and compliant RTO business. MRWED will forward an invoice to the nominated email address. Once payment has been received, the books will be sent via Australia post. Postage will be billed at $9.95. If you would like to arrange payment via credit card and avoid delays, please call us on 1800 287 246 after you have submitted your order.